The Sports & Leisure Forum [https://sportsandleisureforum.co.uk] is a unique event for sports and leisure procurement professionals – and Sports Insight has partnered with the Forum for 2019. Registration is open for VIP delegate spaces and supplier stands at the Forum, which takes place on June 17th & 18th at the Radisson Blu Hotel, London Stansted. 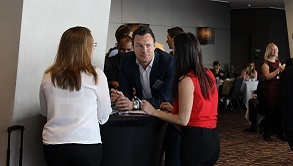 It’s a unique event that brings sports and leisure procurement professionals together for one-to-one business meetings, interactive seminars and valuable networking opportunities. Delegates already registered for the event include representatives from Aspire Defence Services, Aylsham Learning Federation, Bath Cricket Club, Hertfordshire Football Association, High Five Health Promotion, Ice Arena Wales, Leyton Orient Football Club, Orangetheory, Parkwood Leisure, Snap Fitness, Tendring District Council, The Hurlingham Club, The Winston Churchill Sports Centre, University of Hull, University of Plymouth Student Union, Wycombe Wanderers Football Club and more. If you would like to join them, register your place now [https://sportsandleisureforum.co.uk/delegates-booking-form/] to avoid disappointment as there are just 65 VIP tickets available.